During Sony's countdown to its E3 conference, it was announced that the rhythm-action game Beat Saber is coming to PSVR. According to PlayStation Blog, the game will utilize the PS Move controllers as you "slash and cut colored cubes" to a "pulsing electronica beat." Each level of the game will feature original music from composer Jaroslav Beck, and players will be able to compete across global leaderboards. Beat Saber is coming to PSVR later this year. 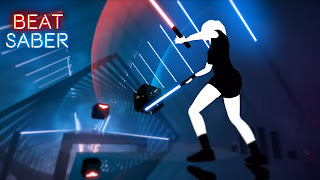 UPDATE 11/12/18 - Sony has announced via the PS Blog that the PlayStation VR version of Beat Saber will be available on November 20. Alongside all the content and music of the early access version of the game available on PC, new songs will be included as well as new sabers.